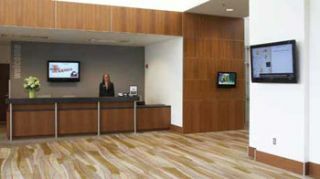 Located in Research Park, the center of entrepreneurship and innovation at the University of Illinois in Champaign- Urbana, I Hotel and Conference Center is an exclusive, convention-class hotel featuring 120 rooms and suites catering to businesspeople, academics, wedding parties, and others who desire an ultracontemporary, guest-focused experience. Attention to detail is its hallmark, from the custom-designed furnishings in the guest rooms to the hot stone massages available at the in-hotel spa. So when I Operations LLC, the company managing I Hotel, sought to upgrade the digital signage in its hallways and foyers, it looked for the very best in both equipment and installation. Its first step was to contact C.V. Lloyde, one of the Midwest’s premier audio-video equipment providers. C.V. Lloyde believed that a best-inclass CMS system would provide not only performance improvements, but also new opportunities to delight guests and even increase revenue. Its search led it to the Black Box iCOMPEL digital signage platform. C.V. Lloyde proposed a redesign of I Hotel’s digital display system that would replace the existing 23 player units with 23 iCOMPEL subscribers (ICOMP02-H) and one iCOMPEL publisher (ICOMP), all located in a central management suite. Located behind each display, a Black Box HD View Receiver (AC3003A) gets its signal via CAT6 from a corresponding rackmounted Black Box HD View Transmitter (AC3016A) and iCOMPEL subscriber located in the management suite. In addition to the zoned layout in iCOMPEL that can be programmed with its own playlist, users can also locally update screen content to instantly add text messages, issue alerts, or select content for specific audiences. Customized layouts are possible by resizing, repositioning, or layering zones with a simple click-and-drag. As Morris pointed out, iCOMPEL also makes it easy for I Operations staff to schedule content whether a week out or on-the-fly. Since the new system was installed, performance and functionality have both improved. Hotel executives have cited the sleek front-end design presented by iCOMPEL; even more, the capabilities of iCOMPEL have allowed the hotel to explore the possibility of using the system as an ad vehicle for local businesses, creating a new source of revenue.